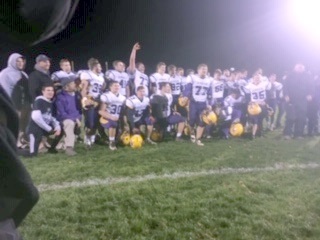 The Denmark Vikings pose immediately following their 20-14 win over Freedom on Oct. 12 in Freedom. Updated from Saturday to include full story with quotes and official stats. 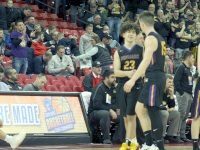 DENMARK – A season that began with a giant question mark ended with a thunderous exclamation point on Friday night. Denmark held off Freedom for a 20-14 win at Freedom high school, propelling the Vikings into the postseason playoffs for the first time since 2014. Seth Alexander intercepted a pair of passes – two of the four Freedom turnovers in the contest – and Denmark used a controlled-clock offense and a stifling defense to overcome an early 7-0 deficit and hold off a late Irish rally to improve to 5-4 overall and finish the North Eastern Conference 4-4, good for a fifth-place tie. The Vikings will travel to Chilton for a Division 4 first-round battle. Chilton finished tied for third at 4-3 in the Eastern Wisconsin Conference, 6-3 overall. The final two Irish possessions ended in turnovers after their offense had suddenly found some life and whittled a 20-7 deficit to six points. On a second-and-one near midfield, Denmark’s Gabe Wertel and Jerick Czarneski broke through to sack and strip Freedom quarterback Reeve Lambrecht. Czarneski pounced on the ball, but the Vikings’ offense couldn’t take advantage. No matter. Alexander leaped high to haul in his second pick of the night near midfield with under four minutes remaining and the Vikings were able to run out the clock and launch a raucous celebration. 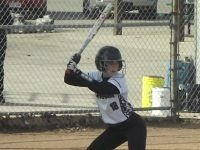 The program had suffered through three straight losing seasons that garnered just eight victories. Denmark won five of its last seven regular-season games and four of its final five. 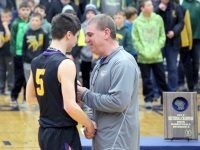 No question mark to begin the season was bigger than what new Viking and first-time head coach Tom Neuman might bring to the program after 13 years as an assistant at a large high school in Dallas. His teaching background in psychology was one of the factors in his hiring and Neuman seems to have brought a players-coach mentality to the job while also instilling discipline and football savvy. 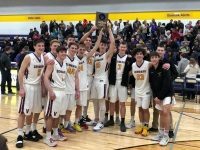 Over the course of the early season, the Vikings demonstrated a resilience that kept them in games and had them competitive with the top dogs in the conference. Two losses this season were by 14 points, two others by seven. That resilience finally bore fruit in a critical Week 7 win at Marinette and again on Friday at Freedom (6-3, 5-3) when Denmark overcame the jolt of a 75-yard touchdown pass that put them in an early 7-0 hole. After that play, the Vikings allowed just 10 more first-half yards and no first downs. In fact, Freedom didn’t pick up its initial first down of the contest until more than half of the third period had elapsed. The defense has been the lynch pin of the Vikings all season and it was again when it shut down the league’s top passing team and held Lambrecht to only 10 completions and 159 yards. The running game netted only 15 yards on 17 carries. Denmark’s ball-control attack combined with the dominant defensive performance allowed the Vikings to run 73 plays to Freedom’s 41 and to hold a time-of-possession advantage of an astonishing 20 minutes. The workhorse as always on offense was Brandon Wavrunek, whose tough, grind-it-out 128 yards on 32 carries was as impressive, if not more so, than the 500-plus yards he racked up over a two-week span earlier this year against inferior competition. And quarterback Jack Satori repeatedly used his elusiveness to escape from certain stops in the backfield and keep drives alive and the clock running. Satori finished with 54 yards on 16 carries. Behind the ever-more cohesive unit of offensive linemen Mason Karl, Griffin Skaletski, Ryan Wochenske, Jackson Koenig and Bradyn Polomis, Denmark rolled up 242 yards rushing on 60 carries and racked up 15 clock-eating first downs. Freedom came in allowing a little more than 100 yards a game rushing. Eight Vikings carried the ball on Friday and Denmark used the passing game just enough to keep the Irish defense honest, with Satori completing 4 of 8 for 41 yards. Denmark took advantage of Freedom’s first turnover of the game – a muffed punt recovered by Wavrunek at the Irish 20 – and scored six plays later. Wavrunek took a toss left and cut it up inside for a five-yard touchdown. Hailey Aschenbrenner’s extra point knotted the game at 7-7 with 4:06 left in the half. Two big plays by Alexander allowed the Vikings to grab the lead before intermission. His first interception set Denmark up at midfield with 2:10 left. Six plays later, Satori, scrambling for his life toward the right sideline, unleashed a pass that Alexander was able to haul in while sliding on his knees at the one-yard line. Satori took it across one play later for a 14-7 halftime lead. “It’s not about me making plays,” Alexander said. “It’s about me making plays for this team. That was my whole goal this entire season was to play for my seniors in their last year. Coach Neuman told us we have to overcome adversity and coming off that 2-7 season we had a real connection. We all love each other and get along so well, on the field and off. The Vikings overcame three penalties on a long drive to open the second half. On second-and-17, a double reverse to Alexander sprung him free down the right sideline and, aided by a Satori block at the 30, he finished off a 47-yard touchdown run for a 20-7 lead with 6:14 left in the third period. 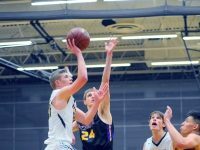 Freedom and Lambrecht finally got the offense going. He had five completions on a 13-play, 58-yard drive that cut the deficit to 20-14 with 1:11 left in the third period. But the defense stiffened over the final 13 minutes. Defensively, linebacker T.J. Weidman once again led the way with three solo tackles and four assists, including two tackles for loss. Wertel also had two stops in the backfield and four solo stops, while Czarneski added two solos and three assists and Jack St. Peter two tackles, including one for loss, and an assist. Wavrunek and Alexander also each recorded three solo tackles. Satori, who was making his 18th consecutive start at quarterback on Friday, said he had a sense of rejuvenation early on during summer practice. “We took a practice off and went out and ran sprints and then we all went over to my house for some team bonding,” he said. “We set our goal of making the playoffs. We didn’t get frustrated by those early losses. We just knew we had to work harder, and we all had trust in the coaches.